Now is the time to bring creative forms of evangelization to the Catholic Church in America. Pope Benedict XVI’s visit filled American Catholics with joy and the hope of moving forward with our beautiful faith. People feel good, once again, about being Catholic. In addition, Priests know that it is easier to deliver Our Lord’s message to an open mind. Adoration Tours is an excellent turn-key tool to deepen the faith of believers, call those who are new to the Lord, as well as reach persons who do not yet know God or even challenge His existence. Due to all the responsibilities and demands on a Priest’s time that can diminish addressing inter-ministry challenges or conflicts, religious have reported that after their parish participated in a holy pilgrimage, their flock became more united and stronger. A real sense of family working together. Let Adoration Tours coordinate with your parish to customize a tour specifically for your needs. Setting up an Adoration Tour with your parish is turn-key - your parishioners can do the coordinating. Step 1: Present this and additional Adoration Tour information to your Parish Board. Step 2: Choose tours from current options, customized for parish preferences and needs. Step 4: Promotion - Pulpit and Bulletin announcements promote the Pilgrimage. ie bake sales, dinner dance, luau, basketball competition at parish festival or picnic, etc. Example: One ministry may volunteer to organize the pilgrimage for the parish. Some parishes will rotate or alternate which group organizes for each trip. If only 10 -15 people each took a spouse, you’d have a group. *Other tour companies divide the cost of the priest into everyone else’s ticket. Adeline covers the cost of the priest herself and does not pass it on to anyone. This is her ministry, not just a business. 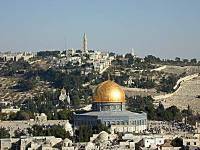 Tour Cost Examples: Holy Land Pilgrimage is the best cost value and great to begin a Pilgrimage itinerary. Marian Shrines in Europe, based on the Euro, can be a bit more costly today but are highly successful and groups fill quickly. There is a tremendous devotion to our dear Blessed Mother. “Pilgrimages at Sea” …. See the Old World in a new way!! As a matter of fact, we most recently have developed “Pilgrimages at Sea.” These are cruises including ports of spiritual interest ie, Fatima, Rome, Florence, Athens, Ephesus, Le Havre (Paris - Lisieux), Dubrovnik (Medjugorje). Unpack once and discover a different port everyday including all the amenities of traveling onboard a cruise ship.. Ask about our "Footsteps of Paul" Itinerary. Adeline will gladly offer a presentation to your parish to help build excitement and enthusiasm for your parish Pilgrimage. Call TODAY for suggestions and ideas ! !